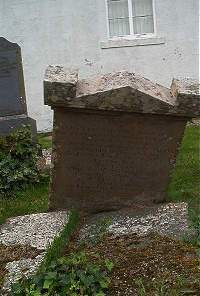 Alexander Keith of Dalvaich died 20th August 1848 aged 86. One who feared God and eskewed evil, he loved the Sabath, was noted for simplicity and Godly sincerity and faith in his generation. Wife Janet Gunn died 28th June 1822 aged 48. Was liberal, kind and hospitable. Son William Keith died 6th December 1841 aged 38. Daughter Margaret Keith died 20th August 1848 aged 34. (On back of gravestone). Erected by George Keith merchant of Denoon in memory of his friends. Grand daughter Janet Sutherland died at Knockally Dunbeath 13th March 1906 aged 81.